Update: Acid-Moss is not a card, in any deck. So I decided to see what all the fuss was about and tried making my own ramp deck and ended up going against someone named athpage (who apparently felt the need to netdeck the thing) and I can definitely see some peoples point about this. He did nothing the first two turns and I was thinking right then he was probably playing moss, nothing but forest on the third turn and i was convinced. sure enough, the next 6 turns were moss, moss, moss, gaea, oblivion sower, gaea. Now I could have dealt with 1, but I don't see how I'm supposed to be able to deal with 3 with more coming every turn. /thread. Card is being cut. Lol. "Remember: Reading the card explains the card." where did you see that? is there an official site that follows news and releases for this game I need to bookmark or something? 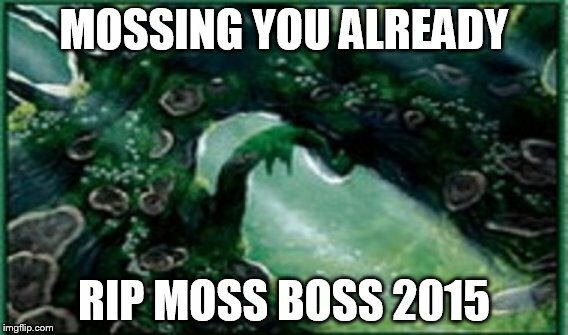 If moss bunch of ****, why everyone play it? That reminds me I need to make some new original cards sometime soon.